President David Granger has pledged to work through the Guyana Defence Board, which he chairs, and with the Guyana Defence Force (GDF), the Guyana Veterans’ Legion (GVL) and civil society to ensure that the recommendations of the Commission of Inquiry that was launched to investigate the living conditions of veterans, are effectively reviewed and implemented. The Head of State made these remarks on Sunday at a Remembrance Ceremony hosted by the GVL at Coghlan House, Carifesta Avenue, where he handed over a cheque of $1M as patron of the Legion. “Today we look to the future and we are all concerned about the fate of young persons, who joined the defence and security forces to serve their country. The plight of veterans has not eluded the Government of Guyana, when I was in Opposition, I promised and when I took Office fulfilled what I called an obligation to investigate the conditions under which our veterans live and work and this has been done,” the Head of State was quoted as saying in a statement issued by the Ministry of the Presidency. 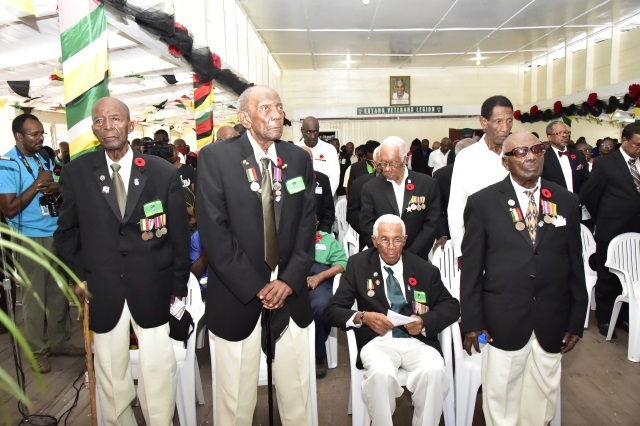 Speaking of the contributions and bravery of Caribbean nationals, who served in the Second World War, President Granger said that not only did some make the ultimate sacrifice but many of those who returned were highly qualified and had inculcated a strong spirit of nationalism and pride. So much so, that many of them took on leadership roles in their respective countries. Among the Caribbean volunteers and recruits that returned, one became Prime Minister of Jamaica and another, the Prime Minister of Barbados. Guyanese Royal Air Force Recruit, Cecil Henry Ethelwood Miller became Chief Justice of Kenya, while Victor Crane, another recruit, became Chancellor of the Judiciary in Guyana. 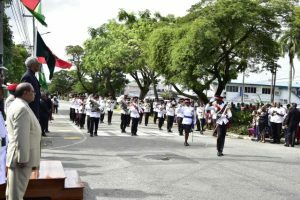 President of the GVL, Lt. Col (ret’d) George Gomes said that it is the responsibility of all to ensure that future generations are taught of the significance of observances like Remembrance Day and of the sacrifices made by those fought in World Wars I and II. He informed that there are a total of 16 surviving members, who served in the British Guiana Battalion of the South Caribbean Forces, all of whom are over 90 years old. He also noted that the GVL is a united front for all veterans including those from the British Guiana Volunteer Force and the GDF. The GVL has compiled a list with a total of 85 veterans, some of whom he described as “total shut-ins”, while others have serious ailments and disabilities. “We continue to be thankful to the Royal Commonwealth Ex-Services League and the Royal Canadian Legion for the annual grants for our World War II veterans and the surviving widows (of veterans). We, however, need much more assistance…,” he said. The GVL also receives an annual donation of from the President. British High Commissioner, Mr. Greg Quinn said that Remembrance Day observances do not honour war or death but rather, it commemorates those who have given their lives in service of their respective countries. “Many of us here have lost friends, colleagues and family members in service and it is important that we honour their memories. They have not died in vain,” he said. He informed the gathering that a long-overdue war memorial has been erected in Brixton, London to honour the sacrifices of servicemen from Africa and the Caribbean who served alongside British and Commonwealth Forces in the First and Second World Wars. Similar sentiments were expressed Canadian High Commissioner, Ms. Lilian Chatterjee who said that the fact that ordinary men agreed to fight in foreign lands for foreign lands speaks to their bravery. Today, several individuals and organisations pledged generous financial support for the GVL. These include the GDF, the different Joint Services organisations, GDF Chief of Staff, Brigadier Patrick West, Chairman of the Guyana Elections, Justice James Patterson, Vice-Chancellor of the University of Guyana, Professor Ivelaw Griffith, Brigadier Edward Collins and the Central Housing and Planning Authority among others. 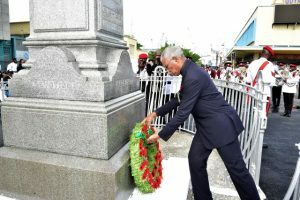 Prior to the GVL’s Remembrance Ceremony, President Granger attended the traditional Wreath-Laying ceremony at the Cenotaph War Memorial on Main and Church Streets. Several Government officials and the members of the Diplomatic Corps also took part in that activity. In his Remembrance Day Message, the President said that the world is forever indebted to those who sacrificed their lives in the cause of peace and freedom. “We remember the Guyanese men and women who struggled for national Independence and who have given their lives in the service of our nation. We thank those Guyanese who continue to defend our territory and our patrimony. We are encouraged, by their example, to strengthen our resolve to preserve the Caribbean as a zone of peace and safety now and for generations to come. We rededicate ourselves to the quest for peace for the Nation and for the happiness of our people,” he said. Remembrance Day is an international memorial day observed within the British Commonwealth since the end of World War I to remember members of the armed forces who died in the two World Wars. More recently, it has been expanded to include those who have died in conflicts after the two World Wars.